the United States. Over the last several years, artisan and gourd lover, Kasin Hunter, has gathered a variety of rare and wonderful collectibles for your enjoyment. Since 1996, Ms. Hunter has chosen only the best utility and art pieces available to stock this Museum/Gallery. For your enjoyment and edification, these pieces include the commonplace as well as the bizarre, unique in use and looks. This eclectic collection is sure to awe and educate each visitor in the use of gourds both in the past and in the present. Ever growing, Ms. Hunter's Museum/Gallery will continue to increase in size and content in order to bring new viewing experiences to repeat visitors. Gourds. A common sight as a third world utility object, humans have found use for gourds as eating utensils, flotation devices, clothing, cleaning devices, symbols of royalty or peasantry, whistles, cages, musical instruments, and so much more. 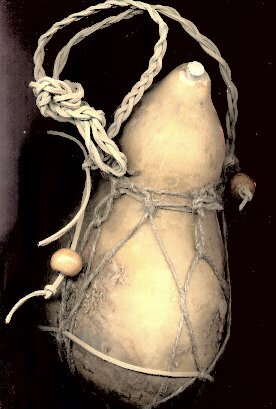 Thousands of years old, the use of gourds has for the most part been cast aside by modern society. Yet how much do we owe to this forerunner of the ceramic bowl and Tupperware! Over a year ago, plans were laid to establish the Museum/Gallery. Now, finally, in the month of September, 2001, the reality is at hand. Finally paying proper homage to this humble fruit and mainstay of thousands of years of human civilization, the Kasin Hunter Gourd Museum and Gallery is now within a few weeks of being open to the visiting public. What can you find at the KHGMG? Although presently small in size, it is large in content. Because the Museum/Gallery is located in sunny southwest Tucson, Arizona, you will, of course, find a healthy sampling of Southwestern-style gourds. Rattles, tortilla warmers, snakes, planters, ceremonial bowls, barrettes, and much more (some are for sale) can be found on this three-tier, Southwest rack footed by a stylized coyote and saguaro cactus. Holiday Hollow is a daily theme in the KHGMG. Here, Christmas, Easter, Halloween, and Thanksgiving are year-round celebrations. Guest gourd art is presented as well as Ms. Hunter's own holiday gourd art. Gourd ornaments adorn a rotating Christmas tree all through the year. On a nearby shelf, Santa and his cohorts add to the Christmas spirit. And of course, there is free peppermint for all visitors to Holiday Hollow! The Easter section is highlighted by a nice egg collection -- but are they real eggs or egg gourds? You decide. A few masks adorning the southern wall. An interesting aspect of cultural development, masks and their use have played a part in human civilization for thousands of years. Who isn't familiar with the joy and tragedy theatrical masks? The Mask of Zoro? Present day horror features depict monstrous creatures sporting masks, hiding the unimaginable. Present day masks can be found in use in Africa, Mexico, the Peking opera, and in our own Mardi Gras and Halloween celebrations. What can more quickly transform us into beast or beauty? The mystical mask. Musical instruments from gourds are displayed on and around the cherry wood piano. Here you'll find such things as gourd rattle from various countries, stringed gourd instruments, drums, and more. From the large to the small, the Kasin Hunter Gourd Museum and Gallery also displays gourd-shaped and double gourd-shaped snuff bottles. Originally used for opium consumption during the Opium Wars in the last dynasty of China (1644-1911), they are now called snuff bottles. These snuff bottles are primarily from China and are made from wood, bone, ceramic, or metal. Visitations to the Kasin Hunter Gourd Museum and Gallery is by appointment only. Contact here, Kasin Hunter Art From My Heart email or call 520-746-1563 for visitation appointments. Arrangement for visitations must be made at least two weeks in advance. A nominal $2.00 entrance fee is collected at the door. As an advocate of animal welfare, Ms. Hunter has stipulated that 100% of all entrance fees are to be donated to the local Humane Society.